After the launch of iPhone XS, XS Max and XR, the Cupertino tech giant have discontinued the four older generation models including iPhone X, 6S, 6S Plus and iPhone SE from the official website in the U.S.
It’s quite understandable that Apple has stopped selling iPhone SE, iPhone 6s and iPhone 6s Plus in the US as they are very outdated and old- generation models. But it’s really surprising that the company has also discontinued the iPhone X as the device features the same design, and price to newly launched iPhone XS, XS Max and XR which influence the sales of recently launched Apple iPhone 2018. 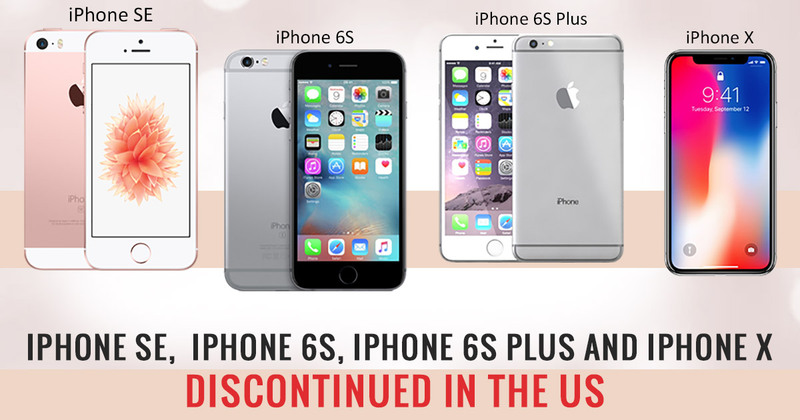 In the Indian market, only the iPhone SE has been discontinued by Apple, whereas the iPhone 6S, 6S Plus, iPhone X are available at an economical price. After the successful completion of Apple Launch event every year, the tech giant discontinued its outdated models and reduced the price of last- generation iPhone. Alongside discontinuation of iPhone SE, 6S, 6S Plus and iPhone X, Apple has also dropped the price of iPhone 7, 7 Plus and iPhone 8. The tech giant stated that the Apple has not retailed a large number of iPhone X but earned a considerable amount of income from it. Obviously, the iPhone X discontinuation is not surprising as previously analyst predicted that the company will stop selling iPhone X in the coming months because of not getting the good response from the customers. The major reason for discontinuation of iPhone X from Apple series, as iPhone X and iPhone XS prices, are similar in the US market. Obviously, customers would prefer to purchase recently launched smartphones which bring advanced software, hardware and all advanced specifications. By reducing the price of iPhone X in the Indian market, Apple would be able to recover its margin as component prices have not dropped as much. The prices of iPhone 7 and 7 Plus have been reduced by Apple. After the reduction of prices, iPhone 7 and iPhone 7 Plus are now available at a starting price of $449 (roughly Rs. 32,200) and at $569 (roughly Rs. 40,900) respectively. On another hand, iPhone 8 and iPhone 8 Plus are now made available at starting price of $599 (roughly Rs. 43,100) and $699 (roughly Rs. 50,200) respectively. Now moving to Apple 2018 series, the iPhone XS and iPhone XS Max will be available for purchase from 28th September 2018 in India. The XS comes with a 5.8-inch OLED screen while the XS Max features a 6.5-inch OLED screen. Both of the smartphone runs on Apple 12 Bionic processor, Face ID and more. iPhone XS comes at a starting price of $999 ( roughly Rs 99,900) for base 64GB variant and goes up to $1,349 (roughly Rs 1,34,900) for high 256GB variant while iPhone XS Max comes with $1,099 (roughly Rs 1,09,900) and goes up to $1,449 (roughly Rs. 1,44,900). What 2018 Apple iPhone XS, XS Max and XR Has To Offer?